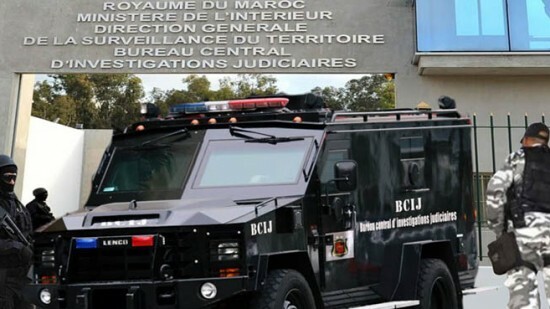 The Moroccan security services have dismantled 168 terrorist cells since September 2011, a figure which shows Morocco’s relentless war against terrorism. About fifty of the dismantled cells are linked to hotbeds of tension, particularly Afghanistan, Pakistan, Iraq, Syria and the Sahel, said Mohamed Moufakir, Head of International Cooperation at the Moroccan Ministry of the Interior. The dismantling of these cells led to the arrest of 2,963 persons and helped to foil 341 terror plots, he explained at a seminar held Thursday in Rabat on the fight against terrorism and extremism in the Mediterranean region. He also said that more than 1,600 Moroccans are believed to have gone to these conflict zones and 147 of them returned to Morocco. After the interrogation of the returnees, 132 were arrested and prosecuted. According to Moufakir, the Moroccan strategy against terrorism is based on a comprehensive and proactive approach, in addition to the reform of the religious field, the consolidation of socio-economic development, human rights culture and multilateral cooperation. The senior official of the Interior ministry said Morocco has strengthened its security cooperation with various partners, including Spain and other European countries. The North African Kingdom is sharing its experience in the field with Sahel countries and is ready to strengthen its counterterrorism cooperation with Maghreb countries, he said. According to US strategic intelligence firm Stratfor, “one of the main factors helping to keep Morocco’s jihadists in check is the competence of its security forces”. Stratfor also said that the country’s powerful intelligence agency, national police force, paramilitary police and Central Bureau of Judicial Investigations (Morocco’s version of the FBI) work closely with their American and European counterparts, receive extensive training and are highly proficient. “Because of Morocco’s robust security environment, it is difficult for jihadist groups to establish operations in the country, despite the large number of militants who hail from within its borders,” stressed Stratfor. Written by: Peter Mulvany on February 10, 2017. Posted by Peter Mulvany on Feb 10 2017. Filed under Headlines, World News. You can follow any responses to this entry through the RSS 2.0. Both comments and pings are currently closed.